The Shift-P2 is a sophisticated RPM engine gauge, designed to be used in your peripheral vision. The Shift-P2+ provides 3 auxiliary channels. Enabling a channel as a profile switch provides an external means of dynamically changing between the two profiles. Changing between profiles occurs with seamless operation. For example, the second profile could be used for an alternative fuel saving RPM range. Or if you were using this on two vehicles, you could connect a channel input to +12V on one vehicle and ground on the other. Set this channel as the profile switch and the Shift-P2 will automatically change profile depending on which of the two vehicles you plug it in too. The available features are subject to change. The Shift-P2 is designed to be compatible with a range of ignition systems. Modern vehicles with coil-on-plug (including those with CAN Bus). ECUs with a Tach Output. 5V & 12V square/pulse signals. Coil packs switched on the negative, including wasted spark. Works with many distributors (please ensure no excessive contact bounce with mechanical distributors). Requires only 3 wires to be connected, RPM (blue), Switched 12V (Red), Ground (Black). The cable supplied uses high quality lightweight flexible wires. 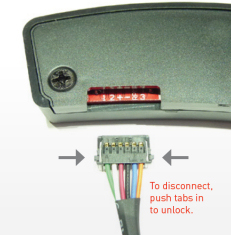 The flat connector is intended for permanent installation purposes only. It is not intended as a connector that is regularly disconnected and reconnected. The connector will only fit with the correct orientation as shown. If you need to disconnect the Shift-P2, switch the power off and push the locking tabs shown to release. Recommended method is to use a small flat blade screwdriver to release one tab at a time. Micro-USB socket is also included for future firmware updates that may be made available. Print the PDF and make a paper cutout to check fitment on your vehicle. Have a 3D printer and want to create your own mounting bracket? 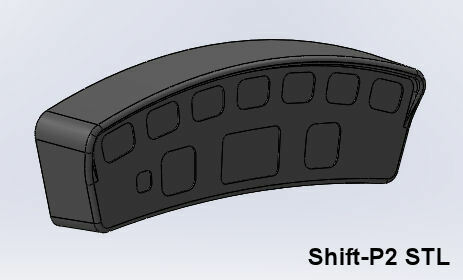 Download the STL file of the Shift-P2 as a reference for your design. Included in the download are two examples for a flat base. These were designed to glue the Shift-P2 to the base. 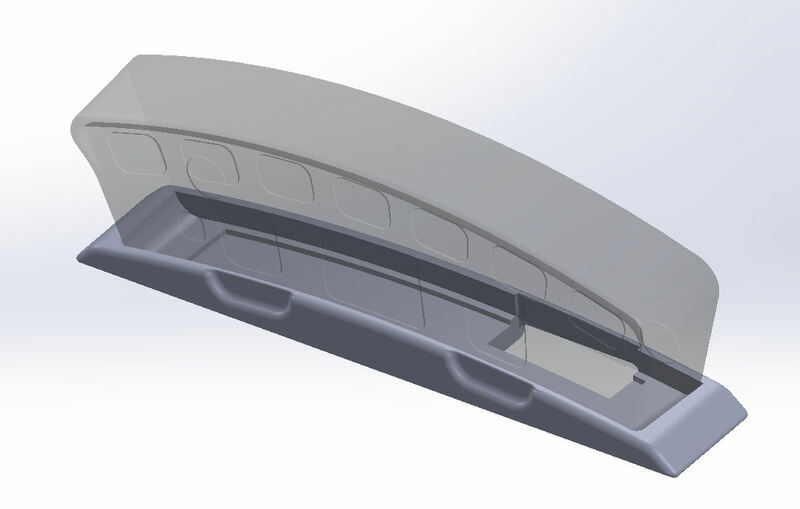 The second model has provision for removable adhesive tape in the base for mounting in vehicle. These are files/images are references for supporting the 3D printing community. Ecliptech does not provide these parts. If you have a drawn a bracket, share your design. We will post here for others! Please note. Do not remove the rear cover or disassemble the unit. Doing so introduces the risk of electrostatic damage to the sensitive electronics and therefore voids the warranty. A flat base conversion, suitable for 3D printing. Click image to download the STL. Thanks to Damien, Main North Automatics, for design input and printing. All units currently shipping from Ecliptech have the latest V16 firmware. You can check the version System –> Product Info and then scroll down. The only reason to update the firmware for earlier versions, is if you want to disable the auto-off timer for the display screen or use the lights sequence 19. If you have an earlier model with the RPM pullup function, which you are using, do not update. This feature was removed as it was too convenient to “try it” without understanding the risks. If you have a PC with Window 10, it’s pretty straight forward. Install the download tool, unzip and load the firmware file, connect to the Shift-P2 using a micro-USB and then download. Early versions of Windows you will likely need to first install a very common FTDI USB driver. I cannot provide technical support for PC drivers issues. Refer to the FTDI website. The firmware update won’t erase your configuration. The same firmware is used for both the P2 and P2+. Very very quick! The RPM measurement algorithm does not use the basic pulse counting technique, or basic frequency to voltage converters. The RPM is digitally calculated per pulse! The digital filter algorithm is biased to displaying an increase of RPM quickly and accurately, while also filtering any electrical noise. The exact time is quite dependent on the frequency of the tacho signal. This level of precision and speed is what makes them an ideal visual reference for drag and motorsport racing. The Shift-P2 is likely more accurate and faster than most tacho gauges. Each light actually has TWO LEDs. They are quite bright and can be viewed from a wide angle! Even with full sun shining on them, you can still see them clearly. They were designed to be bright enough for use on motorbikes, with a wide viewing angle. The in-built light sensor however does a fantastic job of reducing the brightness when the ambient light drops off, which is adjustable. Yes! One of the provided display modes will flash all the lights only when you exceed your set RPM point, just like a traditional shift light. Or you can program a specific display sequence with the Shift-P2+ model. Yes! Use left or right to cycle the display to “Off” temporarily. If you are driving your mother-in-law around and need to keep the engine roar down, you can set the lights to default to the “Off” mode at ignition on. If however your passenger won’t stop talking, press a button and the lights will again let you know where the shift point is. Warnings are still active when the lights are set to off. How do I customising the lights display? The Shift-P2+ model provides the feature to customise the lights display. You have up to 15 Stages (16 including the first with all lights are off). You don’t have to use all 15. You can use 5 if you want. The RPM is equal between all the stages, however you can always (for example) make two consecutive stages identical. That will give a wider gap between lights changing. The little arrow starts on the stage number. That is the stage you are adjusting. Up/Down to go to the next/previous stage. Move the arrow to the right once. If you press Up, you toggle this stage between flashing and not flashing. Press down and you turn the stage off, making this stage and all higher ones not used. This is how to reduce the number of stages used. Move the arrow to the right again and you are on the first light. Up/Down to change its colour (or turn off, no-colour). Move the arrow to the other lights and change them too. Take the arrow back to the left and change to the next stage… and customise this how you want. Individual light colours available… red, green, blue, amber, yellow, cyan, olive, magenta, white, light green and pink. Both a performance acrylic adhesive foam pad and adehesive backed Velcro (brand) for automotive use are included. These have excellent resistance to ageing, water, most solvents and UV light. They stick really well to plastic, but not to vinyl (particularly those with protective waxes applied). Alternative mounting plates may be available in the future. Can I mounts the lights external? This is not possible. They are an internal component in a sophisticated electronics assembly. It is not waterproof. 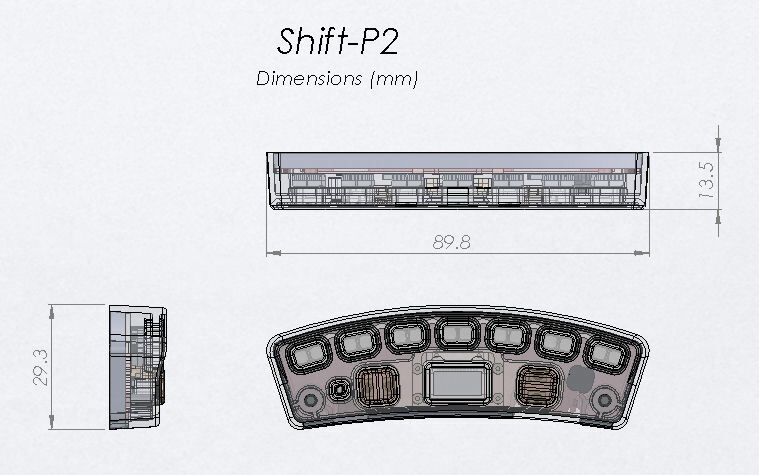 The Shift-P2 must be mounted behind a windscreen, where it is not subjected to the wind pressure or rain. Ecliptech may make a waterproof variant in the future. Please contact us if interested. The Shift-P2 has a 24 month warranty from date of purchase, return to base. This covers manufactured defects, not damage. If you ever have a problem with one of our products, please contact us! * Available for many countries, but not all.